In a timely piece just two days after the terrorist attacks in Paris, Darcie Fontaine reflects on the place of non-white, non-Christian minorities in France and France’s vision of itself. In the wake of the dramatic and deadly terrorist attacks across the city of Paris this past Friday night, for which the Islamic State claimed responsibility, the French public and politicians across Europe struggled to come to terms with the potential ties between the militants and the wave of Syrian refugees who have been flooding into Europe over the past several months. Reports that a Syrian passport belonging to a man who entered Greece with a wave of Syrian migrants in early October was found near the bodies of two jihadis at the Stade de France led European leaders to make the threat of ISIS infiltration among migrants and refugees a key topic at this weekend’s G20 summit in Turkey. Additionally, right-wing officials across Europe have renounced any future plans to aid Syrian refugees in Europe. On Saturday, Marine Le Pen, leader of France’s extreme right-wing National Front party spoke out in favor of tighter border controls in France and the European Union, while analysts suggest that French President François Hollande, a Socialist, will also take a similarly hard line on domestic security and border control. According to The New York Times, Le Pen also declared, “Fundamentalist Islam must be wiped out. France must ban Islamist organizations, close radical mosques, and kick out foreigners who are preaching hatred on our soil, as well as illegal immigrants who have nothing to do here.” News that at least one member of the three coordinated terrorist teams was a French-born Muslim of Algerian descent from the suburbs of Paris, who had been under observation by the French police for his ties to radical Islamists in France, further solidified the connections that many in France have long made between Muslim immigrants to France (and their children who are born there) and terrorism. While these attacks will create an even more complicated situation for the Syrian migrants spread out all over Europe, it also does not bode well for the many thousands of migrants already housed on French soil. The precarious situation of these migrants was also highlighted this weekend when a massive fire broke out in the migrant camp in Calais in northern France, which currently houses nearly 6,000 migrants from the Middle East, North and East Africa, according to the prefect of the Pas-de-Calais region. Although French officials have repeatedly stressed that it had nothing to do with the Paris attacks (it was an electrical fire that was contained and did not cause any deaths), the living quarters of more than forty families were completely destroyed. Although the dire situation in the sprawling migrant camps in Calais has recently received widespread international attention, it is not a new phenomenon, nor one that emerged primarily in response to the Syrian refugee crisis. As Jessica Reinisch discussed recently on this blog, the situation in Calais is an ongoing crisis that fits within a global geography of displacement. Yet, it is also a crisis rooted within specifically French contestations over immigration, asylum, and identity that have their roots in France’s colonial empires and the aftermath of decolonization. 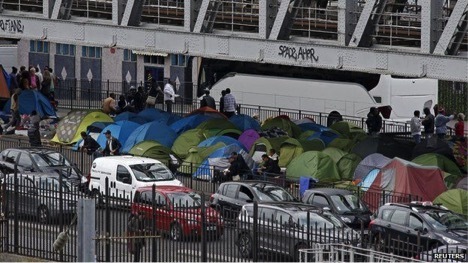 At dawn on June 2, 2015, French police evacuated a camp of over 350 African migrants, mostly Sudanese and Eritreans, that had been slowly building over several months under the metro bridge of La Chappelle in north central Paris. While the migrants were put onto buses and taken to emergency housing, their tents were bulldozed, for what the police chief claimed were “hygienic” reasons and to avoid “threats to public order.” A second massive camp near the Gare d’Austerlitz was evacuated in mid-September. The fate of these migrants is dependent on their legal status in France. Marie Doezema of Al Jazeera reported in June that roughly 100 of the migrants from La Chappelle had presented documentation that they were seeking asylum in France. If they do not leave France imminently, the rest will be viewed as illegal immigrants, taken to retention centers, where they will risk deportation. But even applying for asylum is not a clear and easy proposition. In the 1990s, France began to “crack down” on illegal immigration through both legislation and more active policing. The Pasqua laws of 1993 introduced what became known as the government’s “zero immigration” policy, which made it extremely difficult for foreigners to gain legal status in France. For instance, the law now required proof of uninterrupted housing and employment to renew visas. It also took away the right of those born on French soil to French citizenship; children born in France to foreign parents now had to wait until age 18 to request French nationality. These laws were aimed primarily at stemming the flow of immigration from France’s former African colonies, and the key target was North African immigrants. The Pasqua laws did not emerge in a vacuum but were the result of growing anti-immigrant sentiment both within right-wing political movements and within the population in general. For example, in 1988, the far-right National Front leader Jean-Marie Le Pen won more than fourteen percent of the vote in the first round of the presidential election while campaigning on an anti-immigration platform. The focus on stemming North African immigration was a reaction to the growing violence of the Algerian Civil War and the cultural tensions within France about the status of France’s Muslim community. While North Africans had long formed the bulk of labor migrants to France, beginning in the First World War, the decolonization of Algeria in 1962 set in motion larger waves of both labor and permanent migration, including family reunification. Migrants from France’s other former colonies, including sub-Saharan Africans and refugees from Vietnam also sought both economic advancement and political asylum in their former colonial metropole. After World War II, France experienced booming economic growth of the so-called “trentes glorieuses,” which meant three decades of underemployment. France accepted hundreds of thousands of labor migrants in this period. The economic crises of the early 1970s, however, transformed France’s relationship to immigration. In 1974, France officially ended its labor migration policy. Although immigrants continued to arrive in France after 1974 – some through family reunification, some seeking asylum, and some illegally – the discourse on immigration began to shift in the 1980s away from labor. Instead, officials were concerned about social tensions and the dangers of second-generation “immigrant” youth who failed to assimilate into French society. 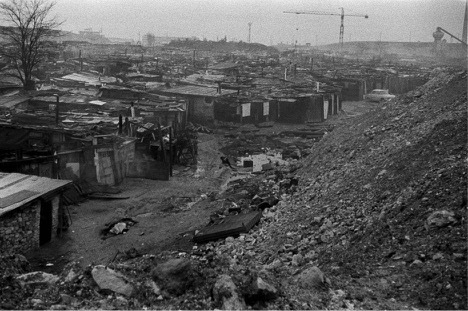 In the early postwar period, many thousands of migrants who came to work in French factories lived in shantytowns on the outskirts of major industrial French cities, but by the early 1970s, they began to move to the HLMs, or French subsidized housing in the banlieues, or the suburbs. The concentration of immigrants in public housing in the banlieues, many of which lack good access to public transportation, has come to signify their exclusion from French society; the term banlieue itself has come to mean “ghetto” rather than “suburb.” Numerous incidents over the past few decades have inflamed tensions between residents of the banlieues and French police, and the prevalent conception within French society is that the banlieues spawn political and religious radicals, notably islamists. The perception that the growing numbers of immigrants are Muslims whose religious practices and beliefs seem foreign to French Republican values has fueled the sorts of terminological confusions in which the word “immigrant” stands in for “Muslim,” and “Muslim” stands for “danger” to French national culture, which is defined as secular. Treating French Muslims as perpetual “immigrants,” even those who have been citizens and assimilated into French society for generations, has led to growing cultural conflicts between France and its non-white citizens. These conflicts have ranged from French legislation that regulates visible religious symbols, more colloquially known as “headscarf laws,” to the 2015 Charlie Hebdo attacks. While the Pew Research Center has noted that there was no public backlash against French Muslims in the wake of the Charlie Hebdo attack, and that French opinion toward Muslims marginally increased (rising to 74% of the French population who have a favorable view of Muslims living in their country, from 72% in 2014), the assimilation of non-white, non-Christian immigrants into French society continues to be a major political issue. It also directly affects the contemporary migrant crisis in Europe. Additionally, the announcement in mid-September from French President François Hollande that France would take in an additional 24,000 refugees from European countries over the next two years prompted unease among local officials across France. The proposal from the French High Committee on Housing for Disadvantaged People [Haut comité pour le logement des personnes défavorisées] that more than 77,000 spaces in “social housing” (also known as HLMs) would be made available for migrants and asylum seekers would potentially solve the problem of lodging. However, it does not solve the problem of legal status, as access to this housing would most likely require having attempted to maneuver the notoriously complex process of requesting asylum. As anthropologist Didier Fassin and sociologist Estelle d’Halluin have argued in a 2005 article in American Anthropologist, the shifting political situation and immigration laws in France during the 1980s and 1990s directly affected the meaning and politics of asylum as well. They write, “Although in France, during the 1970s, up to 95 percent of all seekers were granted refugee legal status, this rate rapidly declined in the 1980s and 1990s—dropping to as low as 12 percent for the administrative evaluation and 18 percent when taking into account the appeals. This dramatic evolution has lead to (1) an unprecedented increase in undocumented foreigners, corresponding to dismissed asylum seekers; (2) a worrying development of spaces of exception at the national borders, to contain the unwanted immigrants before they can even present their case; and (3) a growing suspicion toward all asylum seekers.” In granting asylum, France now considers the body and visible medical trauma as the main evidence of need to grant asylum. Those without that evidence are often rendered uncredible, and not granted political asylum. If they stay in France, they simply become illegal immigrants and subject to deportation. According to Eurostat, in 2014, France received 37,085 asylum applications, of which only 4,245 (or 11.4%) were given Geneva Convention asylum status. Whether that will number will increase in the future, especially given the specific conditions of the growing migrant crisis is difficult to say. Certainly there are numerous immigrant rights associations and even strong suggestions of political will within the French population to help migrants and refugees. However, the current crisis cannot be understood outside the context of the decades-long series of cultural debates and political policies that reflect a deep division within French society over how non-white, non-Christian minorities fit within French society and within French conceptions of national identity. While migrants in Calais were out of sight and consistently perceived as “in transit,” they posed less of a threat than did Muslim French citizens, who were treated as “immigrants.” While accepting Syrian and African refugees into France and potentially even granting them political asylum could ease their immediate material concerns, simply shoving them into HLMs, which are very often in the banlieues of major cities, would not improve their political or social status in the eyes of those who fear that these refugees or migrants will bring Islamic terrorism to France or seek their jobs. The current migrant crisis for France is not just a material crisis but one that will test France’s vision of itself and its place in the world. For the migrants themselves, the path to a permanent life in France is paved with roadblocks, especially after this newest wave of terrorist attacks. Darcie Fontaine is assistant professor working on French colonial history and women and gender history at the University of South Florida.